In Legends, there are five attributes that are used on cards and in decks. They are Strength, Intelligence, Willpower, Agility, and Endurance. Each attribute represents a different type of playstyle. Cards can have up to three attributes on them, though single-attribute cards are most common. Decks can be built using cards from up to three attributes as well. If more than one is chosen, the deck belongs to a specific class. Certain characters and creatures will appear only on cards with certain attributes. For example, Bretons tend to appear in the Intelligence and Endurance attributes, while goblins only appear in Agility. Strength: Strength seeks victory through might. You want to attack the enemy head-on, cutting them down before they can use their fancy tricks. Strength actions are ideal for smashing enemies and clearing the way for bruisers. Intelligence: When you use Intelligence, you rely on trickery and magic to defeat your foes. The physical strength of Intelligence creatures is almost beside the point – you can always cast a spell, equip a weapon, or conjure an Atronach to even the odds. Intelligence actions are ideal for raining destruction on the battlefield and sculpting long-term plans. Willpower: When you use Willpower, you rely on unity and force of spirit to overcome your foes. Willpower is adept at amassing large armies, erecting strong defenses, and bolstering its forces with magic. Its actions are the best at destroying enemy creatures or bending them to your will. Agility: Agility creatures prefer to avoid fair fights, using poison and precision to take down larger foes or cover and movement abilities to sneak past them entirely. Endurance: Endurance will overwhelm your enemy with sheer indomitability. It boasts the biggest creatures in Tamriel with everything from relentless hordes of undead to massive giants and trolls. And with strong guards, potent healing actions, and the ability to increase its Magicka, Endurance has the tools to ensure its monsters come out to play. Some cards are Dual-Attribute or Triple-Attribute, meaning they depend on class rather than a single attribute. Some cards are Neutral, meaning they have no associated attribute and can be used in any deck. 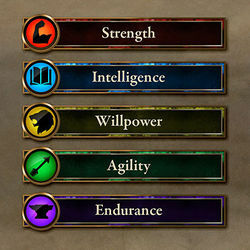 Of the eight traditional attributes in the Elder Scrolls series, three have not been implemented into Legends, as of now. The excluded attributes are Speed, Personality, and Luck. This page was last modified on 7 July 2018, at 08:51.